The track listing for this CD gives the timing of each movement as “#:##,” which may seem like a mistake or an omission until you read the rationale behind the piece. Composer Vladimir Genin explores notions of time and timelessness in the work, concepts that have a wide range of psychological and cultural resonances. According to the liner note by Andrei Navrozov, a terse philosophical tract—although mild by the standards of Russian musicology—Genin is rebelling against the cultural stagnation of the Soviet era. The regime’s efforts to stop the progress of musical history in its tracks led, Navrozov surmises, to an underground culture that celebrated every cultural artifact that demonstrated, or even acknowledged, the passing of time. Shakespeare’s Sonnet No. 77, from which the title of the both the work and the individual movements are taken, is the prime example given, but Proust also gets an honorable mention, as does the Silver Age poet Alexander Blok, whose concept of “timelessness” (bezvremeye) is held up as a prophesy of the cultural implications of the coming Soviet regime. Genin makes amends by writing a work that sits squarely at the end of the Soviet era of Russian piano music, drawing in elements and styles from a range of his predecessors, as if to fit them into the historical chronology that was denied them at the time. This idea also fits neatly into the Russian version of musical postmodernism, which began with Schnittke’s First Symphony, and has since gained ascendency through the music of Silvestrov (who’s technically Ukrainian) and Martynov. Like them, and unlike early Schnittke, Genin avoids literal quotations, yet the meaning and substance of the work is almost always expressed through stylistic allusions that focus on just one or two works of the piano repertoire of the Soviet era. Prokofiev’s 1920s modernism is his starting point, and later on the dehumanizing brutality of the War sonatas is also referenced. The similarly brutal opening of Gubaidulina’s Chaconne is also channeled at the start of one of the movements. The work has a quiet ending based on ostinatos in the upper register, for which Schnittke is clearly the model, although whether the specific inspiration comes from the Schnittke’s String Trio or Piano Quintet is difficult to tell. As the above précis no doubt suggests, everything about this piece is deeply Russian, and that’s despite the composer not having lived in the country since 1997. Fortunately, the performance is just as Russian as the work. 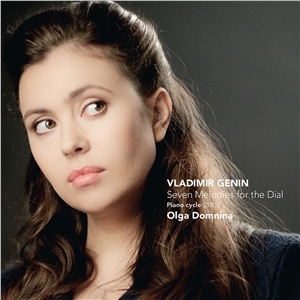 Olga Domnina, for whom the piece was written, gives a passionate and vigorous interpretation. She is clearly au fait with all the models that Genin references, and her own playing draws the music straight into the sound world of its exemplar in each case. Domnina is particularly impressive in the heavy-handed block chords in the lower reaches of the piano, and projects the sound here with a visceral immediacy. She lacks some tenderness in the quieter, more lyrical passages, especially the ending, but even here there is enough atmosphere in the performance to keep it compelling. The sound quality is good, although the piano sounds a little dry, and the upper register slightly muffled, but not to the point of distraction. Recommended, then, especially to listeners with a taste for the piano sonatas of Prokofiev, Shostakovich, Schnittke, and Ustvolskaya who are keen for an update on recent developments from this still active and still fascinating school of composition. Volume 53 of Masaaki Suzuki’s Bach Cantata cycle has been released soon after the announcement that the 55th and final volume is now in the can and will be issued later this year. 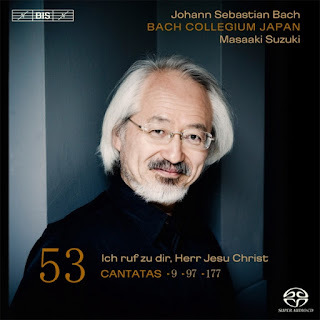 Suzuki has been recording the cantatas in chronological order, so rather than ending on a grand climax, the last volumes fill in the gaps, just as Bach did in the 1730s, with the odd cantata here and there for Sundays that had previously been omitted. The three works on this volume are all “chorale cantatas”, meaning that the text is based on a well-known hymn, with the texts of the inner verses adapted to be adapted to be set as arias and recitatives. According to the liner note, by Klaus Hofmann, the adaptations had previously been carried out by Andres Stübel, former deputy headmaster of the Thomaskirche School. That’s only supposition, but it is supported by the fact that the sequence tailed off incomplete in 1725, soon after Stübel’s death. But in the early 1730s, Bach resolved to complete the sequence. In the cases of BWV 97 and 177, the lack of a sufficiently skilled librettist forced him to use the hymn texts unaltered. From a musical point of view, these late cantatas are modest in their ambitions. There are none of the spectacular set pieces that help many works in the 1720s cycles to stand out. When Bach writes counterpoint here, it is often with all parts, both choral and orchestral, on an even footing, creating homogeneous textures. These even tend towards homophony in places, as the aging Bach begins to accept the prevailing gallant style. The benefit of this more modern approach is that the musical focus is often on long, flowing melodies, which add a decidedly concertante quality to many of the instrumental obbigatos. In allen meinen Taten, BWV 97, opens with orchestral introduction. The first phrases here are slow, but the music soon picks up into a lively Allegro. But even then, Suzuki’s tempos are quite moderate, at least by period performance standards. That feeling continues throughout the album, and while the tempos are never slow, nor does anything ever feel rushed. As usual, Suzuki ensures the music has a strong sense of propulsion from the varied but always definite attacks given to individual notes, especially by the winds. The opening chorus of BWV 97 poses a challenge of balance, with complex counterpoint in the orchestra lying beneath the cantus firmus in the choir. The singers sound a little recessed here, as if the engineers are more interested in the orchestra. The final chorale of this cantata is similarly challenging, as Bach writes independent counterpoint in the orchestra to accompany the already dense choir. But here the balance is ideal, and Bach’s presumably intended effect of making the choir sound larger than it is works well. There are some beautiful arias in this cantata. The fourth movement is a tenor solo with violin obbligato, the seventh a soprano and bass duet, and the eight a soprano aria accompanied by a graceful and opulent duet of oboes. Ich ruf dir, Herr Jesu Christ, BWV 177, opens with an elegant and complex chorus, with an oboe obbligato weaving in and out of the choir. The following aria sets the countertenor in duet with a cello obbligato. This is one of those cases where the instrumental line is so flowing and melodically self-sufficient that the vocal almost become redundant. The pacing here is ideal, with the earthy cello giving a patient account but one that is also subtly shaped and focussed in its phrasing. Es ist das Heil uns kommen her, BWV 9, has the most immediately engaging opening of the three cantatas. Here the chorus is accompanied by a deep, rich oboe d’amore. The inner movements of this cantata focus primarily on the tenor and bass soloists. Although his vocal powers have dimmed somewhat over the course of this cantata cycle, Peter Kooij is still providing the sound that Suzuki seeks. Although a little lacking in definition, Kooij’s performance is accurate and elegant throughout. The other three singers are also Suzuki regulars. All have been remarkably consistent in the quality and musicality of their performances on previous albums, and they remain so here. But, in these more homogeneous cantatas, there are few chances for any of the soloists to really shine as individuals. Instead, this instalment in all about ensemble, and as such, it demonstrates one of the main reasons why the entire cycle has been such a success. There have been occasional guest appearances in previous instalments, especially from European instrumental soloists, but on this occasion everybody involved has a long association with the project. The quality of this album suggests that Suzuki is going to maintain the high quality of his recordings right to the end of the cycle. What a shame these regular issues of Suzuki Bach cantatas are about to come to an end. Let’s hope his next project equals, or even approaches, it in ambition and accomplishment. Like many other orchestras setting up their own record labels, the Vienna Symphony is keen to mix new and old. The label was launched with a Mahler One under their current Chefdirigent, Fabio Luisi, and for a follow up they have chosen a gem from the archives, a Brahms One with Sergiu Celibidache, dating from 1952. 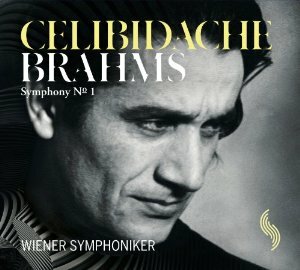 By this point, Celibidache was already principal conductor of the Berlin Philharmonic, and he only worked with the Vienna Symphony a few times, his first concert with them in 1949, his last in 1955. Celibidache was 40 at the time of this recording, young for a conductor by the standards of the day, if not now. Listening to his reading, it is difficult to determine which has the upper hand: youthful energy or mature experience. Most of the tempos are slow, but that doesn’t prevent Celibidache from generating excitement, energy, and drive, especially in the first movement. On the rare occasions that he does pick up the tempo, the faster speeds are all the more effective for their rarity. The reading is highly structured, especially the finale, which Celibidache is able to present as a coherent whole, the progression through its diverse episodes seeming all the more logical for the carefully related tempos between them. The approach is almost Brucknerian, the orchestral textures expansive and luminous, the accents firm, and the progression through the work directed and focused. It’s an old-fashioned approach, or at least it seems so to my ears, and much of the music of the inner movements feels weighed down by the lack of lightness and grace that we’ve come to expect in more recent years. But it is certainly a worthy candidate for reissue; Celibidache’s mystique lives on, and on the basis of this recording it is easy to hear why. Also—and this is a crucial issue for an orchestra own label release—the band is on top form. The orchestra has a measure of the velvety Central European sound, although the tone is slightly brighter and cleaner than that of the Vienna Philharmonic, then or now. The performance sounds well-rehearsed, but still retains a vital spark of spontaneity. The audio standards are good, towards the top end of what we can expect of early 1950s mono. The booklet credits the remastering to “THS-Studio Holger Siedler.” He or they have managed to retain a sense of naturalness and warmth to the sound, and if noise has been removed from the upper range, plenty of the higher frequencies are still present. The packaging is elegant, with Celibidache himself dominating the visuals. The liner note discusses the performance as well as the work, something we sadly can’t take for granted with historical reissues, and all the recording and discographical information we could need is all clearly presented. Recommended, especially to Celibidache fans, and a promising second release from what looks set to become one of the more interesting orchestra-owned labels.